The inclusion of imagery from the flag of the Mohawk Warrior crime organization, a flag born directly out of crime and violence, provides strong commentary on the black eye our province’s police force has given itself by appeasing those who have flown it while terrorizing innocents. 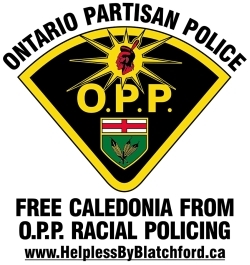 Since sending me the original version David’s updated some of the graphics slightly (I can’t tell the difference, but I’m not a professional graphic artist with an eye for perfection) and added the words ‘ONTARIO PARTISAN POLICE’ at the top. He’s also produced a version (below) for use on T-shirts which we may make available in the future. 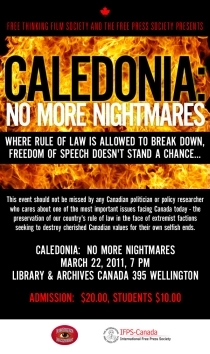 This entry was posted in Caledonia Humour, David Strutt, Mohawk Warriors, Native Protests - Caledonia, Racial Policing. Bookmark the permalink. I love the cartoon and it is more than fitting. 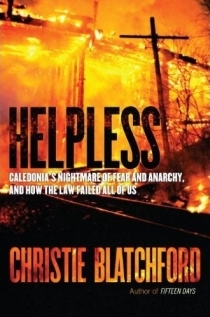 I think Christie Blatchford is going to have to write a new book. “Hapless”, would a good title. We’re about to see Dalton McGuinty hand over taxpayer-owned land to the a bunch of lawless freeloaders, aided and abetted by the Ontario Provincial Police. That’s going to work out well for Caledonia and the town’s future. Yep, all kinds of folks are going to flock to the community for shopping, fine dining, summer recreation … oh yes, and illegal cigarettes from the Mohawk Warrior smoke-shops right there on Argyle Street. Hundreds of potential home-buyers will be climbing over top of one another to purchase property in Caledonia. After all, there’s no risk of having a bunch of Mohawk Warriors invade their new homes, beat them up and claim their property in the name of the Six Nations … is there? Fabulous days to come in Caledonia. 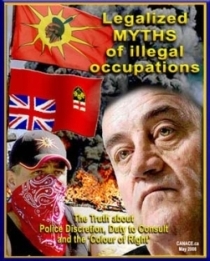 Every Saturday and Sunday at 10:00 AM and 3:00 PM, the new land owners in town can haul an old hydro tower across the street, burn a few cars and re-enact those episodes from 2006 that won them the full support of Julian Fantino and his racist police force. They can even drag out their collection of flags, and that includes that Palestinian one. Perhaps they can even add some new ones, like a CUPE flag or one with the insignia of the anarchist group “Freedonia”. I’m certain the CUPE member from York University, Tom Keefer, could supply those. And don’t forget the good ‘ole Canadian Maple Leaf – flying up-side-down. What a great summer it’s going to be; how proud you are all going to be. You know, I love the Americans. When somebody tries to steal their land or take their money or their freedom, they immediately stand up united and roar their objection and defiance. We used to be like that a few generations ago. Hundreds of thousands of us marched into the teeth and fury of deadly battles to preserve our freedom and property. Why is it that Canadians no longer value their freedom and their rights? How is it that they have completely forgotten all those valiant men and women from the last century, who willingly gave their very lives for them? You might call my last sentence a cliché, but it isn’t; not by a long shot. You know what is cliché (?) 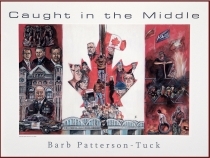 – the Canadian habit of continual capitulation – that’s cliché. 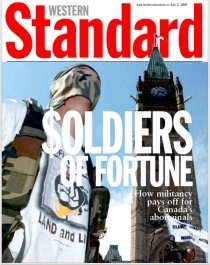 Well there are a few brave and committed Canadians still left and they have been standing up to the six nations and police hoodlums for years now. They have suffered the slings and arrows of outrageous fortune and brutal racism on behalf of the people of Haldimand County. But where is the gratitude? Where is the support? Where are the men of Haldimand, who; if they were to unite and stay united, could easily turn the tide and simply wash over the land thieves and their O.P.P. shills? 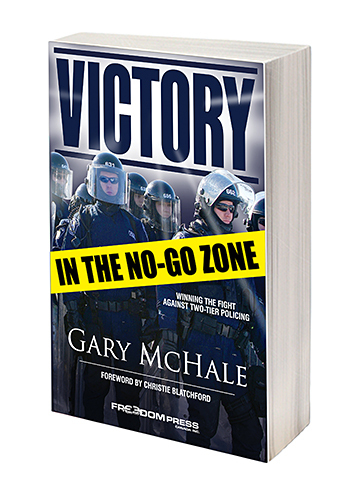 The pretender at Queen’s Park wouldn’t have the courage to defy a unified demand from thousands of voices. So here’s to the Heroes of Caledonia, I tip my hat to you and will assist you wherever I can. I won’t try to list your names because I will, most assuredly, omit someone. But you know, I don’t need to list your names … they are burned into the collective consciousness of every Haldimand resident. Yep, it’s going to be another great summer alright. I hope you can explain it to the kids. 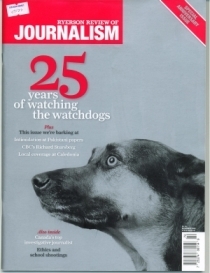 VoC REPLY: Thanks so much for the well-timed comment, especially on the eve of the closing of the heroic Haldimand Regional News which has been a stalwart supporter of the struggle to restore equality and the rule of law to the town, including giving a weekly column to Gary McHale. This of course, made it an enemy to the OPP and the County council. The council pulled its advertising, and the OPP stopped providing the news releases it gives to every other paper. 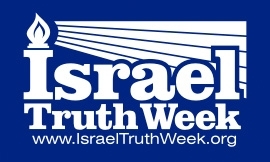 Free speech and justice takes a hit today, Wednesday, Feb 8/12. I expect the people of Haldimand will realize just what they’ve lost, especially when the tax-free shopping comes to the DCE if/when McGuinty and Haldimand make a deal with Six Nations to reward the terrorization of their community. How come it takes so long to moderate a comment which may not be in full agreement with your point of view? Bye the way, I am reading Christie’s book again. 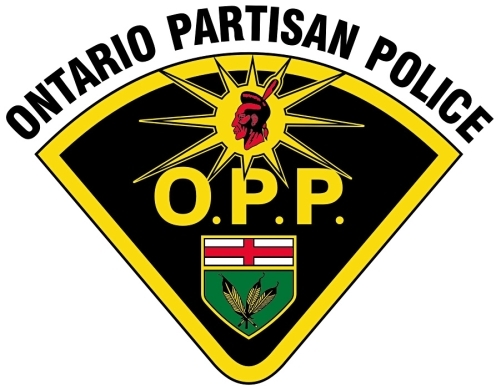 I love the graphic redo of the Opp Cop logo – only one thing I’d change is the 3 yellow feathers on their sheild should be 3 white feathers to sybolize the cowaedly acts of bullies who goon peaceful protesters instead of confronting violent criminal trespassers – or that would blind side a guy with a camera filming their cowardice – or rough up a small woman from the media because she was an easy target for frustrated bullies. White feathers are indeed the new symbol of this bully battalion. IT WAS AN ‘EXPERIENCE’ TO BE THERE ON JAN. 18/12, I HOPE EVERY NEWS PAPER AND TV NEWS WILL SHOW THE PUBLIC WHAT KIND OF DERANGED INDIVIDUALS OCCUPY D.C.E. I’M SURE THE MAJORITY OF NATIVE PEOPLE WILL BE HUMILIATED BY THE ACTIONS OF SO FEW. IF MCGUINTY WILL ALLOW HIS POLITICAL POLICE TO OBEY THE LAWS THEY ALL SWORE TO UPHOLD, WE MAY RETURN TO A CIVILIZED SOCIETY – DEL. VoC REPLY: Del, it’s been an honour to have had you by our side, and it was so amazing that your wife had the courage to come stand with you when so many are so afraid. It was truly a great day. I’m so glad you made the point about how the few thugs that have terrorized Caledonia don’t speak for the good people of Six Nations. That’s been our point all along. 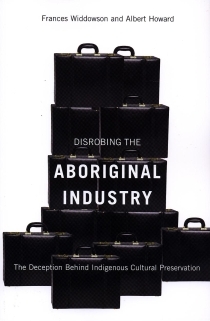 BTW, Gary McHale was on CFRB 1010 today w/Dave Agar followed by Christie Blatchford. Total about 1/2 hr. I think he’s on the Michael Coren show (pls don’t quote me) tomorrow. The opening to Agar’s show is simply stunning in his condemnation of racial policing. 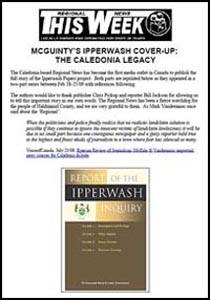 Christine will be posting it after the non-Caledonia stuff is edited out. A lot of people still don’t know what is going on in Caledonia but are appalled when they find out . Love the OPP graphic please let me know if you put them on T-shirts. A tribute to the Heroes of Caledonia (names?) on the back of the shirt would be nice. VoC REPLY: Thanks for the support, Dave. I’d love to do up some shirts and sell them to raise some much needed funds, and I know Dave Strutt would love nothing more but coming up with more designs, but I’m just overwhelmed trying to keep up to do anything about it. I’ve checked out the various online services, but the prices and delivery charges are just too high. 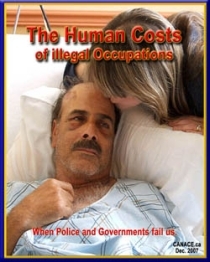 After 5+ years of being smeared, assaulted, arrested and going broke, I think it’s nice that people think we’re ‘heroes’ because it bugs the govt and the OPP, but especially the unions/anarchists/anti-Israelists, etc. who have done their best to stop us from interfering in their dirty little plan to use native people for their own anti-capitalist agenda, however…I don’t think any of us regard ourselves as heroes. From the perspective of why I originally went to Caledonia – because I swore an oath to Canada as a member of the Cdn Forces – no one has shot at me (yet! ), so if someone applies the word ‘hero’ to me, what word would you apply to the troops buried in France because they had the courage to face a hail of bullets on the beaches? Or the soldiers who risked their lives in Afghanistan to save buddies under fire? Sorry to sound preachy, but for those of us at the forefront of the struggle who were or have decided to become Christians (I am one), the strength that we may show in the face of danger from the radicals isn’t ours, and we can’t claim credit. 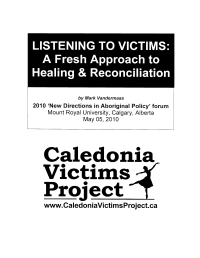 If there are any real ‘heroes’ in Caledonia some of them would be 14 year old Pam ‘Dancer’ Dudych and her family who decided to support her desire to speak out even though they lived in fear for 4 yrs with no police (and still live in fear because they don’t know if the police will abandon them in the future).